In the state rankings, Washington is ranked 41st in the U.S., based on the number of “A” hospitals compared to the total number of hospitals that operate in the state on the Spring 2017 Leapfrog Hospital Safety Grade. This is yet another reminder that we have a lot of work to do to improve health care quality in Washington. According to Leapfrog, safety grades are produced using 30 measures of publicly available hospital safety data. Their panel of experts analyze the data and assign weights to each measure. Measures are then categorized as either process/structural measures or outcome measures, each accounting for 50 percent of the overall score. It’s important to remember that these grades are looking only at safety measures, and do not include other measures on quality of care, cost, patient experience, potentially avoidable care, and many others. 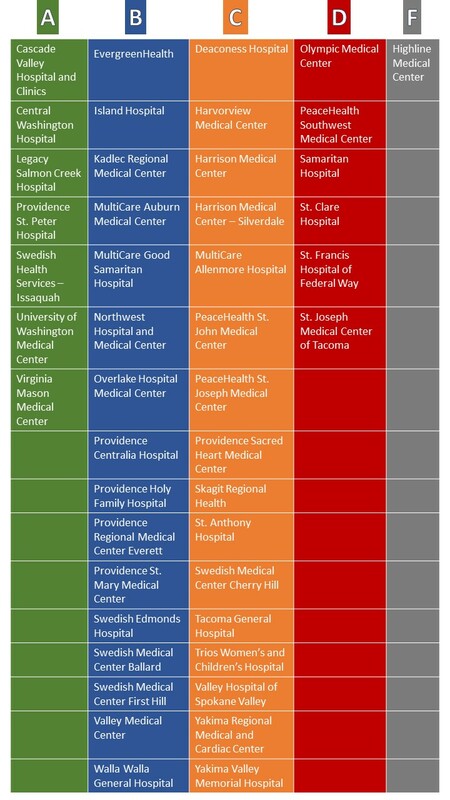 Congratulations are in order for the seven hospitals that were awarded an A grade: Cascade Valley Hospital, Central Washington Hospital, Legacy Salmon Creek Hospital, Providence St. Peter Hospital, Swedish Health Services—Issaquah, University of Washington Medical Center, and Virginia Mason Medical Center. The Leapfrog Group calculates Safety Grades for general, acute-care hospitals for which there is sufficient publicly available safety data, which hospitals have had the opportunity to review for accuracy. Because publicly available data is limited for a variety of reasons, Leapfrog is not able to calculate a Safety Grade for every hospital. Omitted hospitals include specialty hospitals such as children’s hospitals and surgical centers, as well as critical access hospitals. Additionally, many small hospitals, as well as military and veteran’s hospitals, are too small or lack the necessary data to provide to the federal government. For Washington state, the Alliance’s Community Checkup report provides scores for 102 hospitals. Rather than providing composite grades, the Alliance provides individual scores for hospitals based on specific measures, including: Infections, managing medications, patient experience at the hospital, patient safety, potentially avoidable care, pregnancy, and surgery. Both the Community Checkup results and the Leapfrog report underscore the same conclusion: there is a tremendous variation in the quality of care that patients receive in hospitals around the state. Transparency helps to identify how providers can improve the quality of care for patients. But transparency by itself won’t improve care. That takes the hard work of institutions to make the changes necessary to ensure that safety is not just a goal but an achievement. We hope that all the institutions step up to the challenge so that the citizens of our state receive the level of care that they should be able to expect.